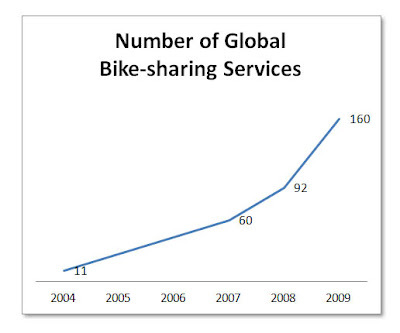 2009 has been another stupendous year for bike-sharing! An unscientific count of the bike-sharing services listed on The Bike-sharing World Map, plus a few more from Spain where bike-sharing services seem to sprout like dandelions, puts the number at about 160 globally. This is up from 92 at the end of last year for an increase of 74% in the number of services worldwide. There are so many services out there now as compared to just two years ago that it has actually made it difficult to keep up with everything that is going on. This is a good thing. Go humans! The planet and its people are ready for bike-sharing now more than ever before. With the Copenhagen Climate Change Conference earlier this month, international support at the highest levels of government was shown for improving how we treat the planet... however we have a long way to go. Conference-goers and activists were representing their home countries in the city that brought the bike-sharing movement into the modern era with Copenhagen’s forward-thinking Bycyklen or “City Bike” service in 1995. If each conference attendee were to take the idea back with them to their home countries and cities, bike-sharing’s reach and its positive impacts would be even more powerful. Incrementally, countries could block the greenhouse gases being created by the encroachment of polluting modes of transportation on sustainable modes like walking and cycling, while making cities healthier and better places to live. Utopian? You betcha! If we have a key which is part of the overall solution, we should use it. As we enter a new decade, The Bike-sharing Blog will be there to follow trends in this nascent industry. Thank you for continuing to make The Bike-sharing Blog the world’s #1 source of information on bike-sharing, public bikes, bicicletas públicas, fahrradverleih, or whatever it may be known as in your part of the world. Wishing you a happy and healthy 2010. I normally don't post propaganda, however, it was either this or a video of the coal that Santa brought, so here's a nice piece that Clear Channel Outdoor created about its SmartBike system. This smooth video discusses its technology and has brief interviews with customers from around the globe using a bike-sharing bike. Whatever the language, there's always the smile. Bike-sharing is good. 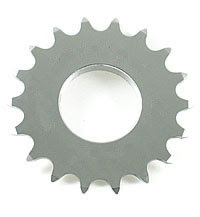 "Take b[bike number] l[lock number] [customer code]"
For example, "Take b20 l88 se1234". Returning a bike is just as easy with replacing "Take" with "Return". Each bike and lock are uniquely numbered. Onroll is currently in or under construction in 28 cities(!) in Spain. There are so many cities and towns already using Onroll, you could say the system is "ubikequitous". The services are generally small with up to 106 bikes and 11 stations. 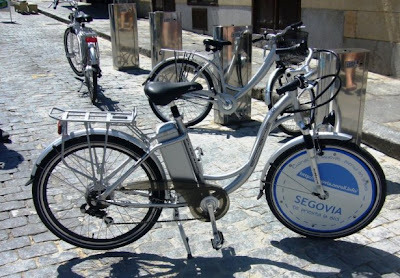 Their services are being offered in cities such as Segovia, where electric-assist (pedalec) cycles are mixed into the offering. "Nice Ride Minnesota, a nonprofit organization created to run a new bike-share system in Minneapolis, received funding authorization today from the Federal Highway Administration. This decision enables Nice Ride Minnesota to proceed with procurement of bikes and bike-share kiosks, keeping the organization on track to launch its bike-share system this spring. Nice Ride Minnesota will receive a grant of $1.75 million through Bike/Walk Twin Cities, a program created through the 2005 federal highway bill to fund innovative bike and pedestrian projects. The City of Minneapolis has been a key partner in the funding effort. Nice Ride Minnesota released a preliminary Request for Proposals in September. That RFP is now published in final. 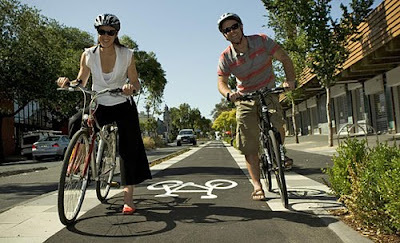 To read the RFP and learn more about Nice Ride Minnesota, go to www.niceridemn.com." Way to go, Nice Ride! MetroBike, LLC worked with Nice Ride Minnesota over the past few months and during this time I learned more about this exciting new program and the people who are making it possible. Minneapolis is in for a treat when Nice Ride Minnesota launches next year. 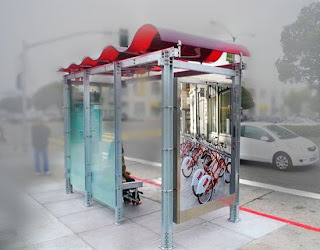 Fog Rolls in on Outdoor Advertising-based Bike-sharing in the U.S. The outdoor advertising model of financing bike-sharing programs in the United States became foggy recently with Clear Channel Outdoor pulling out of its exclusive rights for a bike-sharing service of 1,275 bikes in San Francisco, according to reports in SF Streetblog and SF Gate. Clear Channel Outdoor has a two year old lucrative contract with San Francisco to place advertising on transit shelters on public space. Speaking of the cost of the bike-sharing service, Catherine Carr of Clear Channel Outdoor said, "It's a very expensive program, and in this economy, Clear Channel is not in a viable position to put out millions of dollars," The outdoor advertising model is one in which the proceeds of selling ad space on free-standing panels or panels on bus shelters, pay the cost of a bike-sharing service. As the fog dissipates on this subject, The Bike-sharing Blog will keep you informed. BIXI goes into hibernation. Montréal’s harsh winters and the threat of snow remove bike-sharing from the streets of the city for five months. Yesterday was the last day of BIXI in 2009. Their press release stated, "Currently, it is no longer possible to rent a bike, but users can continue to bring their bikes to the various stations still available in the coming days." This video explains the station removal process. StadtRAD is rolling strong in Hamburg, Germany. This Call a Bike affiliate has 1,000 bikes, but is a bit different because it has 85 stations all with self-serve kiosk. 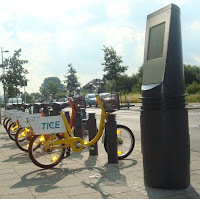 Customers may sign up and rent through the kiosk or the regular Call a Bike telephone method. This hybrid system has been very successful with 223,000 trips having been taken in the first three months. The winds of mid-October brought Breezy Riding bike-sharing to Daejon, Korea. This is the second program in South Korea. For a city of 1.5 million, this is a very small system with 200 bikes and 20 stations, but the electronics on these bikes make it very big in interest. The bikes have an electronic locking system on the handle bars. Registration is on-line and the city's value added transit card can be used for payment. A good overview of the system is at Breezy Riding One and Breezy Riding Two. 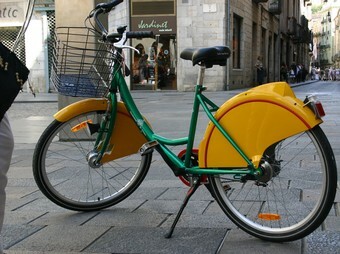 According to the Korea Times, now even Seoul is considering bike-sharing for 2011. According to a City of Paris press release, on Monday the City Council of Paris approved a new contract with JCDecaux for the Vélib’ bike-sharing system. The last year and a half have seen stressful negotiations between JCDecaux, the giant street furniture advertising company, and the City of Paris—the joint operators of the wildly successful bike-sharing program. The new contract gives a larger financial return to JCDecaux. Since the program began, there have been more than 61 million bike rentals. In the original contract, 12% of the subscription and rental income went to JCDecaux, while Paris reaped hefty benefits. Now when the rental income goes beyond €14 million, JCDecaux gets 35% of the amount above that level. When the rental income reaches €17 million, they receive 50% of the income above that level. This new financial incentive will give JCDecaux more reasons to maintain the bikes, give better service, and increase the number of customers. They also must decrease the customer service response time to no more than two minutes by phone, plus share location status and maintenance statistics with Paris in real time. In addition, if more than 4% of the bikes suffer irreparable damage, Paris will pay a replacement cost of €400 each up to a maximum of 25% of the fleet. In return, JCDecaux must give detailed reports on the damage to bikes. It is hoped that this will give a realistic picture of the shrinkage and maintenance problems of the fleet. Now that Vélib’ has expanded to the first outer ring of the Parisian suburbs, the City and JCDecaux are looking at this new contract to help the system become even more prosperous. Japan's first big bike-sharing system is to be a JCDecaux Cyclocity system like the Vélib' in Paris. 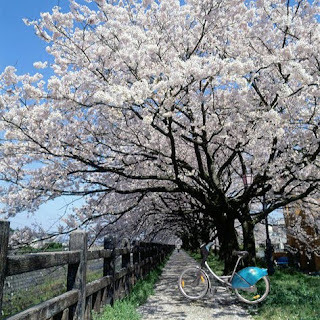 Toyama, Japan just signed an agreement for a small 150 bike and 15 station system according to BusinessWire. The system is to start March 2010. This will be JCDecaux's second bike-sharing system outside of Europe, the other is Brisbane, Australia. 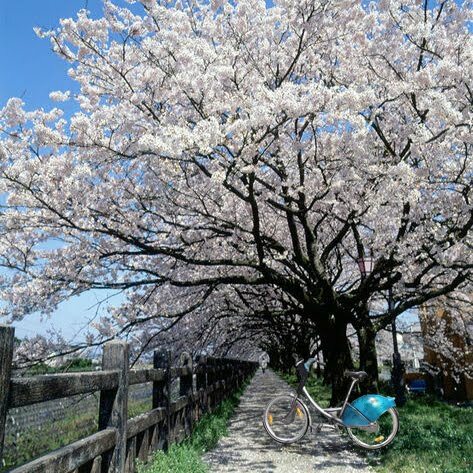 We all have been waiting for Japan to start pedaling with the rest of the bike-sharing world. Update: CyclOcity Toyama started March 20, 2010. Melbourne + Bixi = Melbixi? Australian bike-sharers, don't forget your helmet! The law requires cyclists to wear a helmet which can be problematic for bike-sharing as discussed earlier on The Bike-sharing Blog. ''Initially we'll be encouraging people to bring their own helmets with them,” said Roads Minister Tim Pallas as quoted in The Age. Rental options are also being considered. Just make mine Swine Flu-free please. Here's Mike Rubbo's take on Australia's helmet law in regards to bike-sharing. Kudos to Melbourne for taking this step and to RACV for shifting from a car club to a mobility club. Other car clubs (especially the American Automobile Association) should take note. Thanks to Shaun from Monash U. for the links. After 199 blog posts on bike-sharing, we here at The Bike-sharing Blog want to say a big *THANKS! * as we reach Post Number 200. The Bike-sharing Blog started in May 2007 with just a few readers each day. Since then about 100,000 unique visitors have come to The Blog for news and nearly 200,000 visitors rely on The Bike-sharing World Map to keep up-to-date. So much has happened during these first 200 posts - it's truly amazing to reread old posts and see how much has changed around the bike-sharing world since they were written. Whether this is your first time ever visiting The Bike-sharing Blog or your first time just this week, thank you for coming, reading, and contributing your comments and knowledge to make The Bike-sharing Blog the go-to source for international news on bike-sharing. Russell Meddin and I look forward to sharing with you all of the exciting news which has yet to be written over the next 200 posts. An article in The New York Times, titled "French Ideal of Bicycle-sharing Meets Reality" discusses the problem Paris has been having with vandalism and theft of bike-sharing bikes with 80% of the initial bikes having been replaced. Data has been hard to come by, however, Velib' is an outlier in terms of theft and vandalism in a bike-sharing programs due to social unrest in the Parisian suburbs. Until recently, the suburbs have generally been a place in America, where those who can afford to leave the ills of the city, have fled. In Paris, however, the suburbs are a place for those who cannot afford to live in the luxury of the city. There's technology and demography. I'm not aware of problems with JCDecaux's technology working poorly in other cities that use their system, so demography is the key issue. There's a great deal of social unrest in Paris' suburbs as sociologist Bruno Marzloff stated in The New York Times article. A European Working Conditions Observatory report highlights just how bad things are in France's suburbs with "the unemployment rate... between 35% and 54% for men, between 40% and 60% for women, and between 30% and 50% for young people." Instead of ad campaigns telling people to respect the bikes, JCDecaux and the City of Paris should be using the bikes to respect the people, if they aren't already. The very same individuals who are damaging the bikes should be employed by JCDecaux to repair them. Until the super high unemployment rates decrease, the social unrest will continue and bike-sharing as a representative of the City will be a pawn in their battles. Outside of the social unrest factor, bike-sharing is a good value for its expense. If you calculate the cost per trip of moving a person by bike-sharing, foot, transit, and car, I'd put my money on bike-sharing being the most cost efficient at moving a person per mile. The cost of building a mile of track or asphalt for the other vehicles is expensive, compared to that of what a bike needs. In this calcuation you would need to include the public health benefits in terms of decreased medical expenses due to increased activity, lowered emissions, and increased productivity as folks can spend their time where they want to be, rather than stuck in traffic. Cities spend hundreds of millions working on these issues and bike-sharing leverages benefits associated with each. You would also need to include in this calculation how much positive publicity Paris has garnered from around the world for their bold bike-sharing innovation. 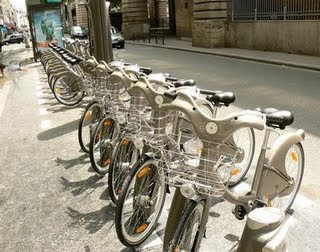 It seems as if everybody has heard about "those bikes in Paris" even if they don't know what Velib' or bike-sharing is. The value of this publicity alone has got to be in the tens or hundreds of millions of dollars. France continues to remain at the top of the list of countries with international tourist arrivals, according to the World Tourism Organization, and it's likely that many of these visitors are visiting Paris and are one of the up to 145,000 trips per day that are made on Velib'. So I'd say that even with a high vandalism and theft rate that bike-sharing is too important to Paris for it to shutter its program. Bike-sharing isn't the problem, it's part of the solution, if we let it be. The Right Price, Too Much or Too Little? 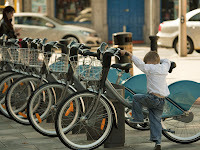 On September 13, 2009, Dublinbikes began with an annual subscription of £10 (about $16). In a little over a month, 11,500 Dubliners signed up for annual subscriptions. Expecting fewer than half this number of subscribers in a year, the program ran out of RFID cards trying to satisfy the demand. No program anywhere has had that many requests in such a short period of time, according to The Irish Times. In a few weeks, 60,000 trips have been taken on only 450 bikes. In the bike-sharing world, what should be the cost of an annual subscription? These costs are as varied as the programs are numerous. What is the right price for the subscription? Admittedly the right price has to contribute to the sustainability of the system. Is it better to have a price that automatically assures the needed level of revenue per bike or per system? In other words make that level by volume. “Elasticity of Demand” is what economists use to start to determine a price. How elastic is the demand for bike-sharing? On May 12, 2009, Bixi began with an annual subscription of $78 CDN (about $73). In a little over 5 months of service, 10,500 Montréalers have signed up for annual subscriptions. This system is very successful with a range of between 7,000 and 12,000 daily usages of the 4,100 bikes, according to Radio Canada. According to the Bixi website, the 1,000,000th trip was celebrated this week. 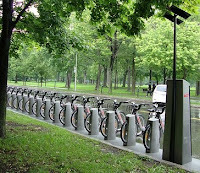 The Bixi program with almost 10 times more bikes than Dublinbikes, has been in service five times longer, and is situated in a city with three times as many people, only has about the same amount of annual subscribers as Dublin. In the more established bike-sharing cities, the annual subscription prices are no more than around $40 as in Paris; Barcelona; and Washington, DC. 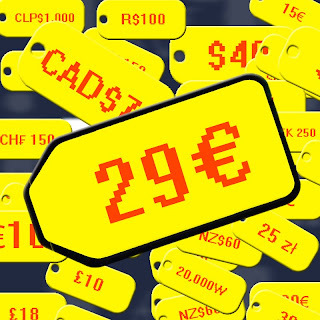 Lyon, France’s annual fee is less, at around $23. These European cities have annual subscription rates close to 10% of their entire city population. They experience daily ridership levels of 5 to 10 trips per bike per day. The small Washington, DC program with 120 bikes has more than 10 times as many subscribers as it has bikes. Could this be because of price? Price is a major motivator to join and use bike-sharing programs. 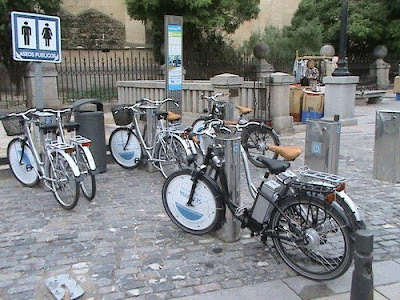 The European experience with pricing should be thought of strongly as a new crop of bike-sharing programs begin in Spring 2010. What is the magic price to maximize annual subscriptions to make a large user base without needing a subsidy? Forty dollars seems to be close to the right amount for a large annual user base. Maybe $39.95 would be catchier! National Park Service's "Employer Bike Fleet"
Recently I had the opportunity to visit the National Park Service’s (NPS) Headquarters here in Washington, D.C. Staff was kind to discuss their efforts at improving cycling at our National Parks and show off their organization’s bike fleet for NPS employees. As the terminology is amorphous at this time, I’m using the term “employer bike fleet” to represent a service only available to the staff of an organization, similar to an organization's car fleet. While employer bike fleets can use automated bike rental systems, the concept of bike-sharing is different as it's open to the public for short transit trips. Earlier this year, Humana donated three automated rental stations to the NPS which they’ve used to connect three of their employment sites in and around downtown D.C. While their employer bike fleet is only for staff, the NPS expressed interest in growing the concept of automated bike rental for visitors throughout the National Park system as well as bike-sharing on the National Mall. What better way to see the park than to be closer to nature and let your eyes frame the scenery, rather than the car’s window frame the scenery for you. Here is a video with Jason Martz, Bike Program Coordinator for the National Mall, showing how staff uses its B-cycle automated rental system. 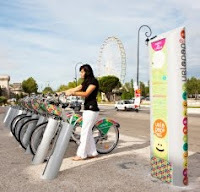 Many cities around the world have been transformed by bike-sharing programs; any resident of Paris, Barcelona, Lyon, etc. could tell you that. Bike-sharing in some cases has led to a doubling of the number of trips by bike, increased use of private bikes, and improved the bicycle’s public relations from that of a toy to that of a sensible tool for transport. Data is necessary to support the costs and benefits of a bike-sharing program, but what does this look like on the street and in the minds of the city’s inhabitants as the bicycle goes from toy to tool? With the Washington, D.C. region creating an expanded program, I plan to write about the physical and mental shift in the urban core of the D.C. region that’s going through a paradigm changing moment in time towards what will likely lead to more cycling for everyday purposes. What will the urban core of the D.C. region experience as our bike-sharing program expands from 120 bikes to that of a legitimately sized system? Will the program be well used? Will private cycling increase as it has in other cities with bike-sharing programs? Will the public image of the bicycle improve? 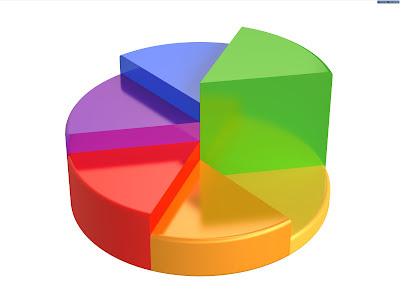 What spin-offs, both positive and negative, will occur during this period? Hangzhou on the go and Wuhan can! Around the bike-sharing world, Hangzhou, China now has 40,000 public use bicycles on the streets in 1,600 stations. The municipal government, as reported in The Bike-sharing Blog plans to add another 10,000 bikes and 400 stations by the end of 2009. According to China’s Nan Fang Daily, in a rush to greet the China’s National Day Holiday of October 1st, the last weeks of September saw 7,000 more bikes and 200 more stations installed throughout this city of nearly 2.65M inhabitants. Hangzhou, the provincial capital of Zheijang, is around 200 km southwest of Shanghai. Hangzhou Public Bicycle Development Company, which launched the program in April 2008, is government owned and will sell advertising space on the bicycles and stations to support the system. Wuhan, China celebrated the National Day holiday with 21,000 bike-sharing bicycles in 740 stations on its streets. In operation since the beginning of this year, Wuhan Public Bikes had issued over 150,000 subscriber cards by the end of July this summer, reports the Xinhua News Agency. Although the system’s web map does not give real time counts for the number of bikes in each stations, it does give pictures of the stations so you can find them on the street. Wuhan, around 800 km west of Shanghai, is a major transportation hub on the Yangtze River. China is embracing bike-sharing even though it has surpassed the United States as the world’s largest automobile market. Leaders in Chinese urban centers are counting on bike-sharing to help reduce the newfound automobile congestion. Currently, Shanghai is developing a bike-share system to service the May 2010 World’s Fair Expo Shanghai-Better City Better Life. North America's second high-tech (3rd generation) university bike-sharing program will be launching at the University of California - Irvine on October 9. 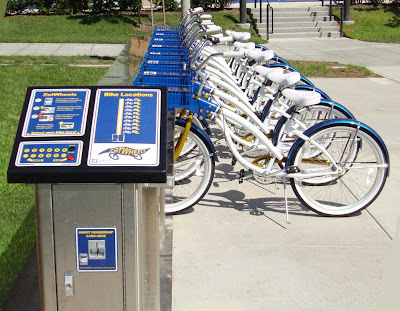 Called ZotWheels, this bike-sharing service will offer 25 bikes at four stations on campus. An annual membership fee of $40 will allow students to check out a bike for up to 3 hours using an RFID card. The program's name is unique, as all bike-sharing programs' names are, but what is a "Zot"? Lynn Harris of the University's Parking and Transportation Services Department, which is offering the bike transit service, reports, "The University opened in 1965 and the BC comic strip was popular at that time. There was an anteater in the strip that would make the 'zot' sound every time it ate an ant. The student body voted the anteater in as mascot, and hence the 'Zot' became linked with us." The bike-sharing system, called Ecotrip, was created by a partnership of Collegiate Bicycle Company and Central Specialties, Ltd. with input from U.C. - Irvine. It's great to see a second university taking the bold step to launch a 3rd generation bike-sharing service. U.C. Irvine is taking a small step here with four stations, but already has plans to expand. I'm sure all anteaters are proud. Update: Here's a video from KABC-TV from Los Angeles.